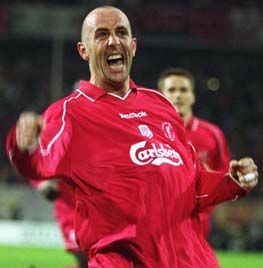 Gary McAllister was signed by Gerard Houllier and became an instant Kop hero as Liverpool won the treble in his first season at Anfield. 'Gary Mac' joined Leeds in 1990 after starring for Leicester, having been linked with a move to Liverpool. McAllister, Batty, Strachan and Speed clicked in midfield and with Cantona up front they created the nucleus of the championship winning team in the 1991-92 season. Macca was voted Leeds' player of the year in 1993-94, but two years later he was on his way to Coventry. Leeds didn't agree to Macca's terms and Coventry benefitted even though £3 million pounds was considered a high fee for a 31-year-old, but Gordon Strachan knew his old team mate wouldn't fail. Gary became Coventry's captain and he even captained his national team for a while. In his final season at Coventry, he was voted their best player. Few could believe it when Macca joined Liverpool in July 2000 at the age of 35, but did he rise up to the challenge! He had a magical season in 2000-2001, his wealth of experience proving crucial in the final stages of the season. He was voted Man of the Match after the UEFA cup final with Alaves in Dortmund, where he was involved with 4 of Liverpool's 5 goals that night. Gary had a second season at Anfield, featuring in 38 competitive matches, before he rejoined Coventry as their player-manager in May 2002. Sadly, his wife Denise was diagnosed with terminal cancer and Gary resigned from Coventry in January 2004 so that he could spend more time with his family. After nearly four years out of the game, McAllister was lured back into football management by one of his former clubs, Leeds United, in January 2008. A popular choice with the Elland Road club's supporters, he took Leeds to the play-off final at Wembley but they were beaten by Doncaster Rovers. Things did not go well the following season and he was dismissed four days before Christmas 2008 after a bad run of results that included an FA Cup exit to non-League Histon.